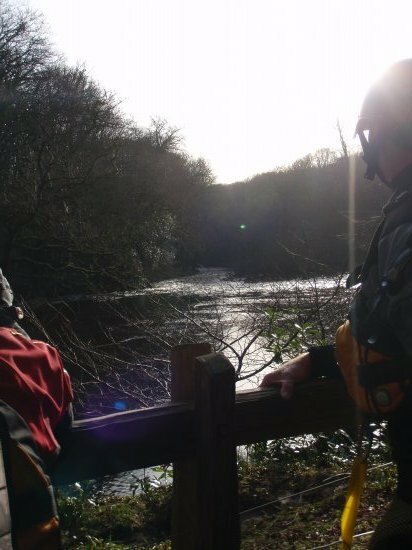 On Saturday morning we met up with Chris, our trainer/coach/whatever, in Buckfastleigh and after a bit of a briefing got kitted up and headed off to paddle the Lower Dart - a new section of river for me. We took it in turns to lead the group, going through different styles of leadership and running rapids (one at a time, eddy hopping, inspecting from the boat or bank, etc). In many ways it was better to do this on a new and unknown bit of river, as it avoids the tendency to do everything 'from memory'. hard to see the rapid with the sun shining on it! I found this all really interesting, especially being the least experienced 'leader' of the group of us. I've got used to keeping an eye on things from the back, so I still find it a bit weird to be the one at the front. 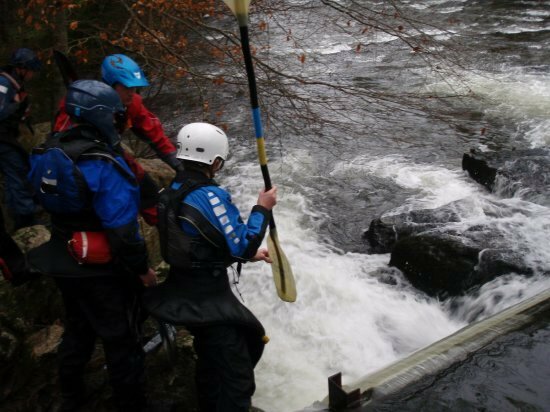 Sunday's plan was to paddle the Tavy from Tavistock down, doing more of the same. Unfortunately an assortment of factors (lots of climbing, lots of kayaking, sleeping in my coldish bedroom with my shoulders tensed up around my ears, sitting hunched over a computer all day, etc etc) added up to some seriously tense and achy shoulder/neck/back muscles, and so I had to make the difficult decision not to paddle I could have done it anyway and probably been fine, but I didn't want to risk making it any worse especially as I've got another weekend away coming up.. Instead, I played shuttle bunny, then wandered up the river bank as far as the weir so that I could at least join in with discussions there. Once off the water, we went through all the kit we carry - or don't carry, as the case may be! I was well aware that I didn't have the complete set of 'river leader' kit, but actually I could easily improve this without it taking up too much more space/weight in the back of my boat. We retreated to the pasty shop in Tavistock for a proper debrief and a bit more paperwork, then headed home.